In a large skillet over medium heat, cook the onion for 5 minutes, until soft. Stir in the cumin, chili pepper, cocoa powder and cook 30 seconds. Add the bay leaf, roasted tomatoes, salsa, and broth. Scraping the bottom of the pan to break up any brown bits. Stir in the ketchup, Worcestershire sauce, and tabasco if desired. Bring to a simmer and let cook 30 minutes. Remove from heat and carefully puree in a blender until smooth and thick. 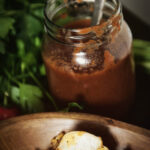 Save sauce in a jar or airtight container for up to 1 week in the fridge.